Did you really think they'd coast through the playoffs? Did you really think they'd face no adversity on the way to possibly winning the Stanley Cup? Did you really think it would be easy? 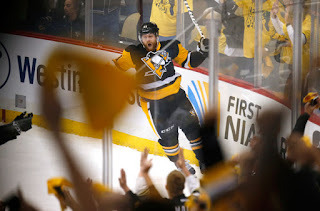 After the Penguins lost Game 5 of the Eastern Conference Finals to the Tampa Bay Lightning social media was aflame with moaning and groaning of the end of the Pittsburgh Penguins season. As it's users are wont to do, very little positive came from the belly of the hive mind's beast. They had declared, and so it was to be, the Penguins season was over. Pack it in. This stands in zero contrast to the Game 1 loss to Tampa, the Game 5 loss to the Capitals, the Game 1 loss to the Capitals, and the Game 2 loss to the Rangers. At every loss the Penguins were dead in the water with no hope of a return. Pack it in, another stunning failure by a team accustomed to it. Instead the Penguins would rally back and win the day. Eventually the series. And yet here we are, no one having learned any lessons of having faith or staying strong when backed in to a corner. A search of twitter shows many believers, with #Pensin7 or #PensInSeven showing a plethora of results. Just as many, if not more, are already packing it in and deeming the core in need of broken up for once again failing abysmally in the playoffs as they always have, ignoring the fact that they have the second most playoff wins in the salary cap era. Many are already calling for heads to roll, for trades to be made, for players to be stripped of leadership roles. People who forget that the 2009 Pittsburgh Penguins, who won the Stanley friggin Cup, needed to win Games 6 and 7 to beat Washington in the second round. People who forget that the 2009 Pittsburgh Penguins needed to win Games 6 and 7 against the Detroit Red Wings to win the Stanley friggin Cup. Could the Penguins season end tonight? Sure. It's a distinct possibility. Ever since Mike Sullivan took over, however, these Penguins have shown a will and resiliency that hadn't been seen since that 2009 squad that won the Stanley friggin' Cup. When their backs were against the wall for even making the playoffs they skyrocketed to be one of the best teams in the league. When their best was needed in the post season they delivered. When they needed to win they found a way. Feel free to count the Penguins out tonight if you want. If you're already willing to give up that's on you. The playoffs aren't a cake walk. They never have been. If you're prepared to throw in the towel before the puck is even dropped, maybe hockey isn't the sport for you. These are supposed to stress you out and make you worry. As for me, I'm going in head held high expecting two victories, expecting what these Penguins have done best: win when it matters. At every loss the Penguins were dead in the water with no hope of a return.